After a very large, mid-afternoon Christmas Eve dinner at my in-laws, my planned Crown Roast of Pork in Calvados Sauce with Apple-Pecan Dressing seemed….. impossible. Especially since we were expected for dessert at friends’ and still had some gifts to wrap, etc. . This may have been our late supper, but it would make an equally nice, easy and elegant, Christmas Day brunch since it takes roughly 15 minutes to prepare. 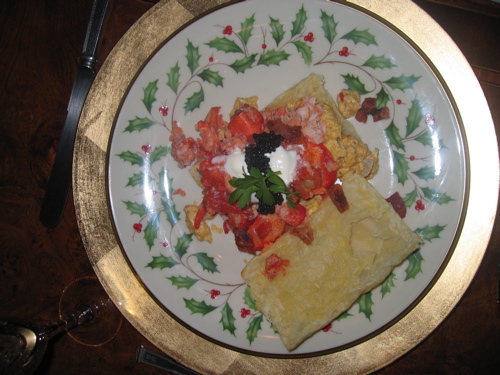 Soft scrambled eggs with scallions and Roma tomatoes, lobster sautéed in butter and sherry, topped with bacon/lardons, crème fraîche and “fauxruga” (American Caviar) served over puff pastry. Merry Christmas. And thank you for reading and your many, very kind comments. I couldn’t do it without you. This entry was posted in Uncategorized and tagged caviar, Christmas brunch, Easy and Elegant Christmas Supper. Bookmark the permalink. Thanks for another GREAT food item! BUT…you must stop posting them because they make me run off and eat something!!!! Merry Christmas to you, Elegantologist. Thank you for making the world a better, more beautiful and more civilized place! Oh, what a treat! 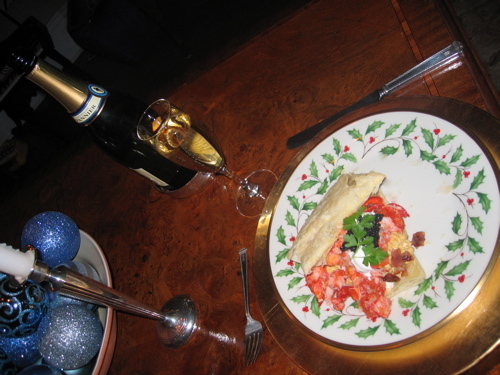 We had an “omelette” for a pre-church breakfast, and for our Christmas Dinner – we had, Filet, Potato’s Gratin, Fresh French Beans, Salad with Pomegranate and Sliced Almonds. Unfortunately the “Bouche de Noel” was chilling on the porch and some squirrels, had a “tasty noel!” The door was slightly ajar,due to the “dog” going out for a stroll. We shall never forget this Christmas! You’re welcome Mr. Lane. The crown roast was less of a success, however. CashmereLibrarian, And to you and yours. Keep fighting the good fight! Mrs. PvE! Oh my… worthy of an illustration. Sated squirrels and a patent leather, fur trimmed boot by a hoof in the snow…. Merry Christmas. A very Happy Christmas, and Boxing Day, to you and yours! Merry Christmas and the Happy of Holidays to you and yours! It didn’t seem to matter that I was already stuffed full of Christmas dinner, I still found myself drooling at your meal. Did you make the puff pastry from scratch? If so, please share the recipe! Hello TBD! Best of the Season to you and yours. I’m glad you found the recipe intriguing. The puff pastry was f the frozen variety. I needed fast and easy. The couple of extras that I made were used this morning for scrambled egg and country ham breakfast sandwiches. Highly recommended. Thank you Pamela! These are the project days here at the manse. Instead of hiring out, we are DIY’ing… as close to the spirit of Boxing Day as we get. Merriest of Holiday Wishes. Hello Aesthete! Delightful! I did get a copy of “Dining with Proust” that I’m anxious to delve into…. will look into your suggestion ASAP. Sounds like a lovely Christmas! I found another book for you and will mail them both this weekend… I am such a slacker. Love the Lenox china and the lighter fare. I feel as if I’m becoming a standing rib roast this year. Now that Richmond has Trader Joe’s, we’ll never go hungry again. Next year save the lobster meat for your friends down the street. And instead, drizzle a bit of truffle oil on those eggs; so good you’ll want to slap yo Mama. Aesthete, I’ve just ordered my copy of “Dining at Delmonico’s.” Can’t wait. Thanks for the tip. Fairfax, thanks! They’re delightful. The note’s headed for the mail today.